Welcome to the part in the story where you start making things like GUMBO on the weekend because you are a lover of spicy things and because you are starting to work on being well-prepared for a week’s worth of meals. Spicy, creamy, made-from-scratch, slow-simmered gumbo’s got your back and you will be better because of it. All of that served over a pile of steamy rice – if you’re going for the gold, healthy brown rice or quinoa is delicious, too – and topped with some little micro greens or sautéed spinach. You might as well just go ahead and open a restaurant in your house right now. Gumbo is kind of a weird recipe for me to be making on Pinch of Yum, but truthfully, Pinch of Yum generally revolts against any of my pre-planned recipe ideas and seems to glob on to the more scrappy, last minute ones. Which is how we find ourselves here with a big bowl of gumbo in front of us. Not even complaining. The first time I had gumbo was when we went to New Orleans last year. Er, I think I had it? I can’t even remember. I know I had étouffée – how similar are these things? Someone please educate me, and by educate I definitely do mean buy me a ticket back to New Orleans so I can eat my way to such high levels of knowledge. We were celebrating birthdays with my family a few weeks ago when my mom lifted the lid on her soup pot and stirred something super delicious-looking and told me it was gumbo. GUMBO, you say? I peered in at this huge pot of liquid gold situation and thought: I know nothing abut this // I MUST MAKE THIS. I interrogated mom about how she made it, studied her printed-off recipe (s/o to Food Network), and then, a few days later when I couldn’t hold myself back any longer, I made my own version of gumbo right in my very own kitchen. Here’s the thing – I am not from the South (this is where they eat gumbo, right? omg I’m so sorry that I’m this embarrassing) and I did not follow any sort of strict anything other than my hungry stomach in order to make this *true* gumbo and so I’m so very sorry if I’m offending any purists here. What I did: thought back to mom’s printed-off recipe, thought about what I wanted in my gumbo, polled the Snapchat audience for support on the does-gumbo-need-okra question (y’all say no), and then just went for it. We’re coming for you, Gumbo! I’m calling this WEEKEND gumbo because a) it’s more interesting, and b) it really wants you to make it on the weekend. This guy is going to be a gift that keeps on giving once you’ve really let all those flavors get happy together. And friends. That doesn’t happen in 30 minutes between a quick trip to the gym and your nighty binge of Netflix. No, this is one for a lazy Sunday afternoon. We’re talking about slowly cutting up all the vegetables and letting things simmer for a good hour or so, and maybe even keeping the whole pot on low for another hour afterwards once the roux, andouille, and shrimp have been added because that andouille really packs a flavor punch, and then leaving everything a little while longer in the fridge so it’s ready for future lunch / dinner / freezer meal awesomeness throughout the week and just completely overloaded with delicious, slow-simmered weekend flavor. It’s the only way we do things, right? I can smell your weekend house right now and it is REALLY GOOD. 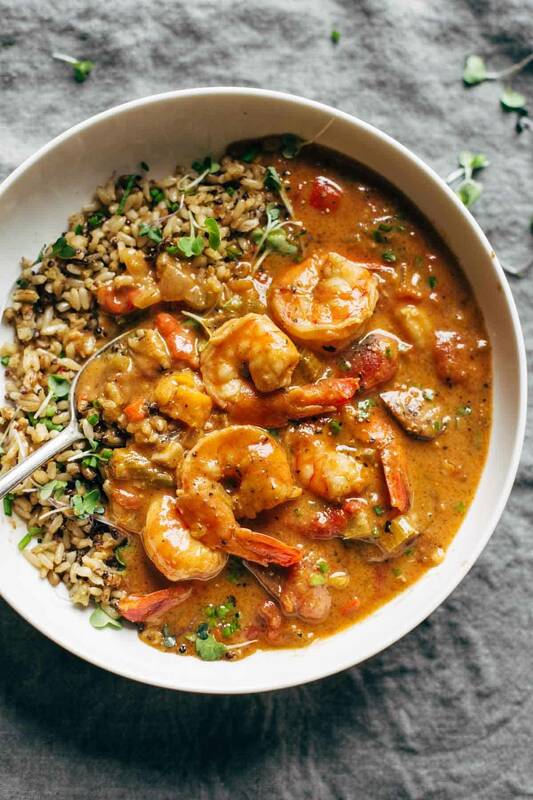 Spicy Weekend Gumbo – familiar ingredients like garlic, carrots, celery, onion, tomatoes, flour, butter, shrimp // simmered for an hour or two on the weekend to make for awesome meals all week! VEGETABLES: Heat the oil in a big, deep pot over medium heat. Add the garlic, hot peppers, mirepoix, and vegetables. Saute for 10 minutes or so until it’s all soft and fragrant. BASE: Add the tomatoes, broth, and spices. Bring to a low boil; reduce heat and simmer for an hour or so for the best flavor. ROUX: Melt the butter over medium heat. Add the flour and let it all bubble in the pan for a few minutes. Add the milk or broth a little bit at a time, whisking to incorporate it and make it smooth. Season with salt. FINISH: Add the roux to the gumbo pot and stir to combine. Simmer for a little longer over low heat or just let it all hang out for a while to help the flavor develop. Stir in the sausage and raw shrimp. When shrimp is pink (fully cooked), stir in a handful of chives and serve over brown rice, red quinoa, white rice, or just by itself. It’s that good. Remember: make sure to season with salt! This will vary per individual recipe based on your cajun seasoning mix. *Mirepoix: This is just a fancy name for diced onion / celery / carrots – you can cut up your own or buy it already chopped and mixed for extra time-saving. *Cajun spices: A pre-made mix works great. This is a good one – it doesn’t have MSG. Otherwise you can make your own easily with pantry spices. If your mix does NOT have salt, be sure to season with salt generously at the end! *Sausage: Any brand works, but Aidells is my favoritebecause 1) it’s cleaner than most – no weird ingredients, and 2) it packs the HEAT. If you add the shrimp too soon in the cooking process, it shrinks up into tiny little shrimpy-things that get really tough. Don’t do that. This makes GREAT leftovers which is why I consider it a perfect weekend recipe! I stored leftovers in the fridge for a few days, but it freezes well too. Reminder: Thanks for all your tips and expertise in the comments. Just as a friendly reminder, this recipe is my take on gumbo and it is not necessarily supposed to be traditional or authentic. I used a creamy butter / flour / milk roux mixture to make it a little bit creamy, and I did not use okra, and I used a chicken andouille sausage, etc. etc. Not traditional, I know, I know, and it’s TOTALLY DELICIOUS! I hope you like it! Dynamite Plant Power Sushi BowlsIt’s a Food Photography Workshop Extravaganza! Yum!! This sounds delish and will definitely be making it this weekend. What’s even better is, sans rice and with roux substitute (probably adding arrowroot, if needed), it’s Whole30 compliant (successful Day 4 of my journey!). BTW, love your bowl? Where can I buy? So, true story: I’ve never made or tasted Gumbo before. BUT, that’s about to change. This recipe sounds amazing, Lindsay! Can’t wait to try it out, hopefully for dinner next week! I am embarrassed. I have lived in the south all my life and haven’t even had gumbo more than twice in my life…let a lone made it 0_0 This looks like the version I need to make happen STAT and no longer shame my fellow southerners. Huh, I don’t know if anyone would consider my house a restaurant as it always looks as though a tornado struck it (who makes all the mess anyhow?) but the idea of this Gumbo wafting threw it just cheered me up. I love how your mom was your inspiration. My mom always has tons of advice for my blog as she is an avid gardener as well. And sometimes, sigh, it’s a tough life when your mom reads your blog! Heaven in a bowl. I’m so in love with this and cannot wait to try! I adore cajun food, and this looks amazing Lindsay! Leftovers??? No way – not with gumbo asluscious as this! This looks delicious! I look forward to making this recipe – I just have a question about the sausage… Should it be cooked before adding it in with the raw shrimp? Thank you! That type of sausage is already cooked…it just needs heated. Can the recipe done the day beforehand? OMG…love! Even as a fellow MN, I’ve actually made gumbo a couple times, and my husband and teenage son loved. My 3-yr-old wouldn’t even look at it, but that’s to be expected (3-yr-olds are crazy people). This recipe will happen this weekend for certain! Thanks for solving that one! One question…what is the delicious rice you used in this photo? I must have it! It’s a Seeds of Change mix! I think it was like brown rice and red quinoa or something like that! The only time I’ve ever had gumbo was when I was in the New Orleans-themed area of Disneyland and ate one of those bread bowls with the spicy gumbo inside. It was delicious, but man, what a heavy dish, right? I love that yours has a mix of shrimp and chicken sausage for a variety of protein! I may or may not make the roux, but this is definitely a win recipe! thanks Cassie! hope you like it! Love this recipe! I grew up Southwest of New Orleans so I’ve spent the better part of my life eating and cooking gumbo! It’s always nice to see how others change and adapt the recipe! To answer your question – etouffee is generally made with a tomato base and lots of chopped seasonings. (I say that loosely because there are no set rules with cajun food). Gumbo is made with a flour and oil roux. thanks for the tip Cheryl! The first definition for gumbo in the Oxford Dictionary is ‘okra.’ That aside, why would you not want to put okra in your gumbo? I didn’t happen to have any on hand. Thank you for sharing your expertise Wanda! This looks delicious! I love gumbo and I can’t believe I haven’t tried making it yet. I am from the south, and I firmly believe that you can eat gumbo anywhere! I’m glad you tried it and liked it! Also, I suppose you don’t need okra in gumbo, but if your’e a little shy about it and not sure if you like it, go somewhere where they make authentic fried okra and you’ll fall in love. I wasn’t sure about it at first, but as soon as I had some that was done well, I haven ever looked back! yes! totally agree. thanks for the comment Jess! Lovely Lindsay! Looks soo yummy! And stunning clicks as always! 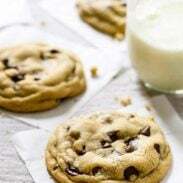 Hi Lindsay – Love your blog and this recipe looks amazing. I haven’t made gumbo in years but this is going to change soon ! Just an FYI that most chicken sausage – including Aidells – using pork casings. Since I don’t eat pork (besides this seems somewhat counter intuitive to me) I usually get Applegate organic chicken sausage (available at Trader Joes and Whole Foods). They are casing free, which just means the sausage tends to crumble as it cooks, but it still tastes good to me. I also know Bilinski makes chicken sausage without casing, and though I haven’t tried it yet, it comes in yummy flavors like Apple Chardonnay, Pesto, and Cajun. Andoullie. These are available at Whole Foods as well as Mom’s Organic Market. Enjoy! Thank you for the tips Marcy! It can be really hard to find the right kind of sausage that isn’t filled with junky ingredients 🙁 so I’m sure this will be super helpful for people. I’m from the South and love gumbo. Please do add okra to it. You can buy frozen, cut okra and add it when you add the shrimp at the end or just before. Others are right. There are so many variations of gumbo. As long as mine has shrimp in it, I’m happy. I’ve never heard of gumbo with milk in it. Sounds so interesting. I think I’ll give it a try. I’m interested if any other Southerners make their gumbo with milk as an ingredient. I’ve never heard of it either, and I’m 61 and have read many gumbo recipes. I have never had REAL gumbo. I’ve definitely had some boxed kind in the past but I don’t count that. My husband loves these kinds of flavors so maybe I’ll have to surprise him with this for dinner some night. aww yay! have a great trip Libby! Will defnitely be trying this out this weekend with the quinoa..
Would you recommend almond flour as a good paleo alternative for the Roux, Lindsay? Yum love gumbo! I have family is in the south who say “ya’all” and make fun of me for saying “you guys” haha! I wish we had a better phrase in the Midwest than “you guys” but I say it too! so ingrained! I diced them! I’ll update the recipe to say! Thanks for the question! Looks absolutely divine! I’ve never made gumbo before because I’ve been intimidated but you make it look easy. Looking forward to giving this a try! 🙂 Also any updates on the Cebu Shelter after your fundraising? They must be over the moon! Lindsay, I made this gumbo today (Sunday), and it’s AMAZING. It was my first time making gumbo, and I was delighted that your recipe wasn’t intimidating and has tons of flavor. Will definitely be making again! that makes me so happy. thanks for the comment Holly!